At check-in registration, each team must submit a roster certified by their state soccer association and an official USYSA player pass or equivalent for each player and coach. No player may play for more than one team per age bracket and no roster changes will be permitted for the duration of the tournament. Any team using an ineligible player will be disqualified from the tournament and forfeit their registration fee. Roster exceptions granted at the discretion of the Tournament Director prior to the start of the tournament. Teams may have up to three (3) guest players. 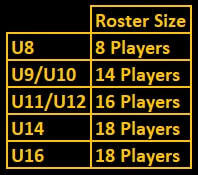 All guest players must be officially listed on the roster certified by your state soccer association. Handwritten entries will not be accepted. If you bring a guest player, he or she must have your offical guest player form from your state. Please contact your state office for these forms which must be signed and stamped by the state registrar if they have not been officially added to your roster. In addition to the above qualifications, each player must be represented on the signed Medical Release Form and an eTravel form should be completed with their state soccer association. Medical Release forms and USYSA player pass or equivalent must be available at each game for inspection by referees and/or tournament officials. Referees and assistant referees are USSF certified. U10 will be a single man system with best effort made to call offsides. It is the responsibility of each coach to make certain they have received the correct game schedule at registration. Regardless of weather conditions, teams must be on the field of play, ready to play and field a minimum of seven players and one coach within five minutes after the scheduled start of the game. The winner of a forfeited game will be credited with a 1-0 winning score. Only tournament officials may cancel, postpone or reschedule a game for any reason. Games terminated for any reason after twenty minutes of play will be considered official and the score will stand. All players must wear protective shin pads and molded bottom or screw-in plastic soccer shoes. No metal cleats are allowed. Players’ shirts must be clearly numbered with a unique number. In the event that team colors are the same or similar, at the sole discretion of the referee, the home team will change colors. The home team is the first team listed on the game schedule. All player equipment is subject to final inspection and approval by the referee. Players, coaches and spectators are expected to conduct themselves within the spirit and letter of the Laws of the Game. Proper conduct shall be determined in accordance with the Laws of the Game and shall be solely at the discretion of the referee and tournament officials. Either the referee or a tournament official may eject a player, coach or spectator from the field of play. A tournament official may take additional action and eject any player, coach or spectator for cause, at his or her sole discretion, from further participation in the tournament. The eligibility of any player or coach receiving a red card to participate in the next scheduled match shall be at the discretion of tournament officials. Coaches, substitute players and spectators are required to remain at least three yards behind the touch line and between the penalty boxes. Both teams shall be on one side of the field and the spectators on the opposite side of the field. a) Prior to a throw-in by the team in possession. c) After a goal is scored. d) At half time or prior to the beginning of an overtime period. a) After an injury only to replace the injured player. b) To replace a cautioned player. U8 age bracket will operate under sub-on-the-fly rules. a) Total points accumulated [Three (3) points for a game win, One (1) point for a game tie and Zero (0) points for a game loss). b) Results of head-to-head competition. f) Most goals scored with no more than a four goal differential spread allowed per game. g) Knockout competition according to FIFA rules. Brackets of 8 team groups, a final game between the winner of each 4 team sub group will play for championship/runner-up on Sunday. Brackets of 6 team groups, each 3 team sub group will play pool play on Saturday to determine standings. Saturday standings will determine semi-finals and finals for Sunday. The third place team from each sub group will play consolation game on Sunday. Brackets of 4 team groups, a final game between the top two teams will play for championship/runner-up on Sunday.